*Breaking News - 10/26* I'm pleased to announce my Oct release Ever My Merlin has broken into the Barnes & Noble Top 30 Teen New Release. My Boyfriend Merlin has broken into Barnes & Noble Top 50 Teen Bestsellers. Yay!! And thank you for your support! Mythology? It's just my thing! Hope you enjoy a chance to win some fab prizes in the hop! For those of you unfamiliar with the My Merlin Series here is a short blurb of the books. My Boyfriend Merlin, Book 1: A young Merlin goes to high school to recruit candidates to pull the sword from the stone but ends up falling in love instead. My Merlin Awakening, Book 2: Two wizard brothers. One sword. One girl. Catch some mermaids on the trail of the Fisher King. Ever My Merlin, Book 3: In the conclusion of My Merlin, to survive the day of reckoning, Merlin searches for the Healing Cup. The barbarian halted the sword mid-swing. A foot shoved me and I fell over on my back. Another soldier, an angular, yet muscled teenager with even yellower teeth, peered down at me. He sniffed the air and then leaned down to sniff me. I noticed gill slits on both sides of his neck. The pale green of his skin deepened to hunter green around the gills. A mermaid. Even his eyes were slightly green. 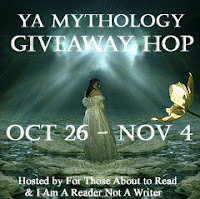 Special thanks to Tiffany @ For Those About to Read & Kathy @ I am a Reader not a Writer for hosting the hop! 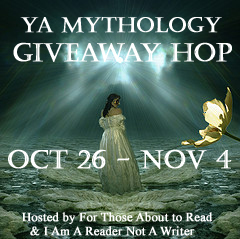 Enter the Rafflecopter below to win and continue on the hop! Priya Ardis. Ethereal theme. Powered by Blogger.